Improve your DevOps through automated unit test and continuous integration. XaTester is the most advanced and flexible tool at the market for writing and executing automated unit and integration tests of programs on a mainframe or IBM i. 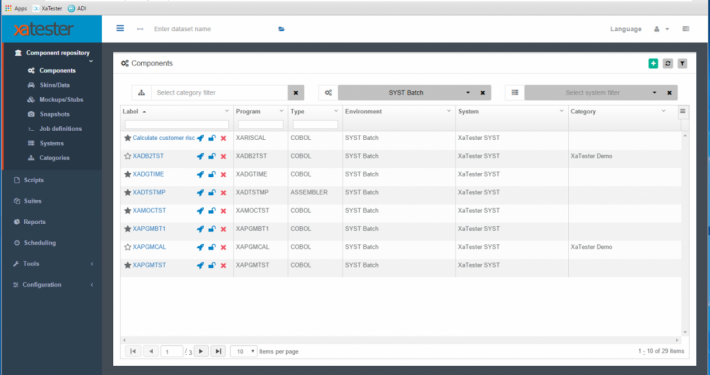 With XaTester you can test programs written in COBOL, PL/I, EGL, RPG and Assembler and it provides advanced features such as virtualization of sub programs, automated execution of tests through scheduling or integration with external build system and generation of web based user interfaces for easy manual testing. You can even use user interface based test automation systems to drive the execution of your backend unit tests. Writing tests in XaTester does not require coding skills, which means that developers, testers and business users can easily collaborate in making tests that covers many scenarios. One scenario can be a simple test with execution of one program with specified input data and expected output data. Another scenario can be a complex test that involves a variety of steps such as retrieving data from DB2, initiating JCL jobs, executing several programs in a sequence and comparing datasets at the mainframe. XaTester will be able to improve your DevOps dramatically with improved quality, shorter turnaround time and lower costs as a result. Integrate XaTester into your own build process, quality management systems and reporting systems, through a rich Rest based API and achieve complete continuous integration. You can also use the build-in scheduling mechanism to schedule test executions based on a time interval. Results can automatically be published by sending emails to subscribers or it can be sent directly into your quality management system. 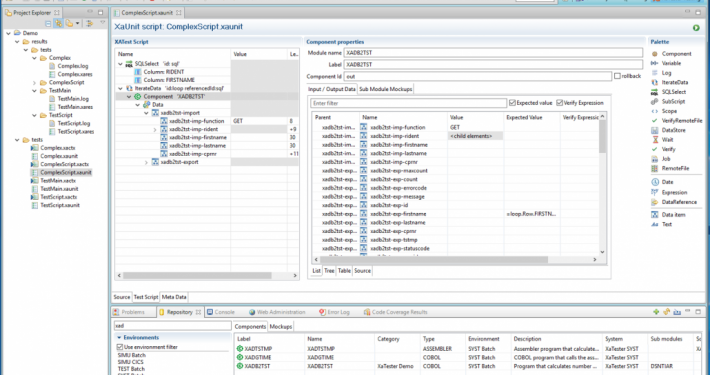 XaTester comes with an Eclipse based client – a free version of Eclipse or as part of commercial tools such as IBM Rational Developer for z or Rational Business Developer. It also comes with a browser client, which makes it easy to get started writing and executing tests. If you have any questions or if you want a demo of XaTester, please do not hesitate to contact us either by E-Mail or by phone.